Never thought I would say this, but… How I’ve missed drawing streets! I really enjoyed doing these, particularly the alley, because it made me think about the kind of stuff you would find there. Omg this page is gorgeous! 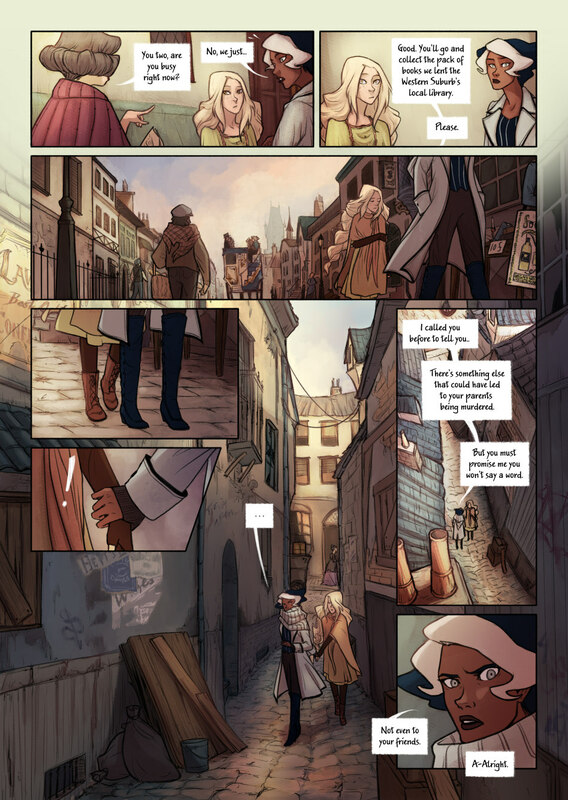 The layout is interesting and different and each panel is just… I don’t know how to describe it! The different angles are just awesome and the details are splendid! And what better place to share secrets than a shady alley? Usually “don’t even tell your friends” is bad news, BAD! D: Be careful what you promise, Suzzen! Thank you! ^^ I’m glad you liked it! It took a long time but I feel it was worth it! Hope you don’t mind me asking, but what real-life cities inspired the look of Cwen? I would say the scenery is gorgeous, but I don’t think of towns that way. Your art is awesome though – great job on that alley in particular. And I think there is a typo: I believe the past tense of ‘lead’ is ‘led’. Also, Prof Lovell’s expression in that last panel is so severe. Love it! What is she gonna say? Glad I don’t have to wait for the next page! Thank you so much for commenting on that! I didn’t notice the typo until you said it! I’ll edit it and update the page soon ^^ I’m also glad you liked the alley, it was something completely new for me to draw! Cities that aren’t composed of mostly skyscrapers can be attractive. Modern cities not so much unless it’s an area with old historic architecture and trees. She never said anything about writing them though.